This is the first time watching this film. Huge Jeff Bridges fan and so this was a treat for me. Don’t know why I never saw this film, but thankfully now I have on a wonderful Blu-ray with a High definition transfer. Twilight Time choose another good film to express on a new outlet. The movie looks fantastic and sounds amazing. Another great Blu-ray to own. As I have stated this stars the wonderful Jeff Bridges. I have been a fan basically my whole life. After seeing him in 1971’s The Last Picture Show back in the early 80’s, I was forever a fan. He does a great job in this movie as always. He plays the character of Richard Boone in Cutter’s Way. Boone spots a man dumping something in a garbage can. The next day a girl has been found murdered in the spot Boone was watching the mysterious man dump the garbage. To make things worse, the reason Boone was in the area, was his car. It had broken down in that same area of the body, and so he becomes a suspect. Boone takes it upon himself to expose the man who he thinks he saw discarding the body. Directed by Ivan Passer. Passer has directed some memorable films throughout his life. Starting back in the 1960’s all the way to 2005. He has left his mark. He directed one of my favorite TV miniseries, Stalin. Truly a wonderful miniseries. Robert Duvall gave an extraordinary performance as the dictator Stalin. The movie itself is pretty good and ranges from the history, coming into power and also the personal life and horrors that he did to his people, and also to his own personal family. He was a ruthless mean sonofabitch, and Robert Duvall plays the weird character perfectly. Passer has that ultimate way with characters in his films. He makes those characters come to life, and in Cutter’s Way, it’s the same as in Stalin, the players are thought out, thick in action, and an ultimate conclusion of belief, for the watcher of those characters. Bridges and the story telling are brilliant. Flawless acting. Amazing performances. I think Cutter’s Way is truly an underrated film. This also stars the wonderful John Heard who I feel has always been an underrated actor. He shines in this part of Alex Cutter. Heard is spot on in this role. Also starring another underrated actress, the beautiful Lisa Eichhorn. Who starred in the wonderful 1971 film Yanks, which might I add, she was nominated for a Best Actress at the Golden Globes. 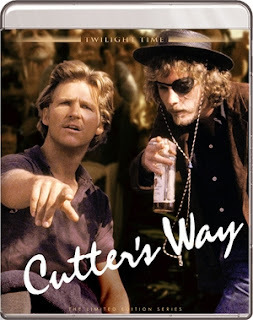 Cutter’s Way is a great thriller. It has all the wonderful elements of a Crime mystery. It was based on the book Cutter and Bone by a wonderful author named Newton Thornburg. Another book of his has been turned into a movie, 2009’s Beautiful Kate. Cutter’s Way is a thick murder mystery. It evolves into a cat and mouse of just what is the truth. Another wonderful choice for Twilight Time’s 3,000 Unit Special Edition productions. A great example of a Blu-ray of a forgotten film that should be seen and expressed. This looks absolutely amazing. Spot on. Wonderful transfer. Beautiful crisp imagery. Spot on sound. Perfect example of how to treat an older film, and change it into a High Definition product that is worthy to praise. Isolated Score Track. This is a wonderful special feature for the simple fact a genius, and often overlooked, or forgotten about musician is behind this music. Bernard Alfred “Jack” Nitzsche, was an arranger, producer, song writer and most of all film score composer. Sadly, this master passed away in 2000, but left a world of music mastery. He was truly a guru of the music world, working with bands such as The Rolling Stones, and many musicians, such as Neil Young. But it was his movie world ties that expresses to me his ultimate mastery. All one has to do is look at his resume for the movies. One of the best soundtracks ever in my viewpoint, the masterpiece film, and my personal number one choice of best horror film, 1973’s The Exorcist. He worked on 1975’s masterpiece, One Flew Over the Cuckoo’s Nest. The very underrated 1980’s Cruising. 1982’s An Officer and a Gentleman, 1984’s Sci-Fi classic Starman. The perfection that is 1986’s Stand by Me, and many more. He was perfection in film score and music world, and Twilight Time honored his mastery with this special feature. Audio Commentary with Film Historians Julie Kirgo and Nick Redman. Another flawless trip into the expertise of film. A wonderful commentary that is truly a great listen. It’s always great when those who do commentaries, are lovers of film, and show that love. Kirgo and Redman are listening, knowledgeable perfection. Another wonderful Blu-ray. A great, mysterious thriller that should be seen. Perfect acting, tight story, amazing direction, perfect music. Twilight Time has done it again in capturing an important film, that should be watched and remembered.